Breakfast with Mathieu at La Borie (aka home) in the Drôme Valley. By now, I’ve lived in France for a total of just over one year (excluding my months-long visits to the US), and I recently realized that I’ve never written a post about my life here! After 7 days trekking in the Scottish highlands (see previous post), I went on a brief tour of several other countries of Europe, visiting England, Belgium, the Netherlands, Germany, the Czech Republic, and France, for a second time. 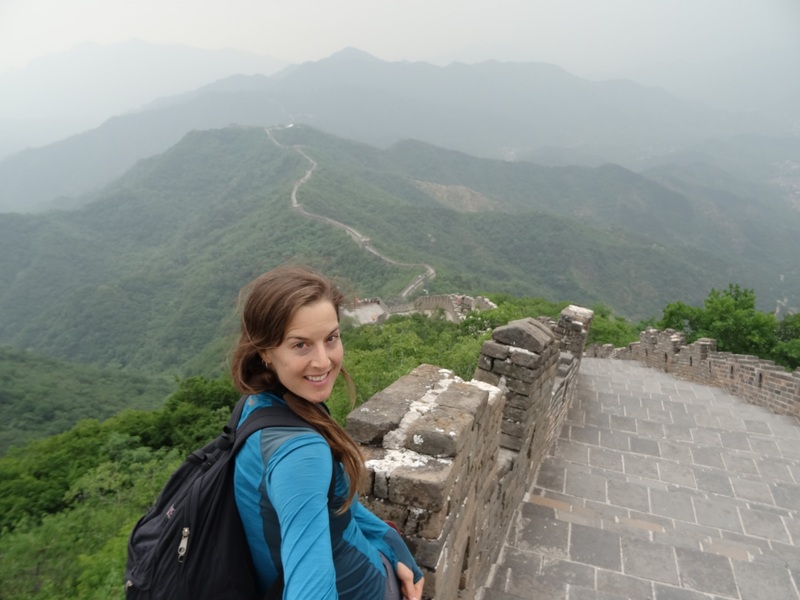 So how did I spend about 5 weeks in western Europe? Exploring the culture and history of some beautiful cities and surrounding natural areas and hanging out with friends, of course! 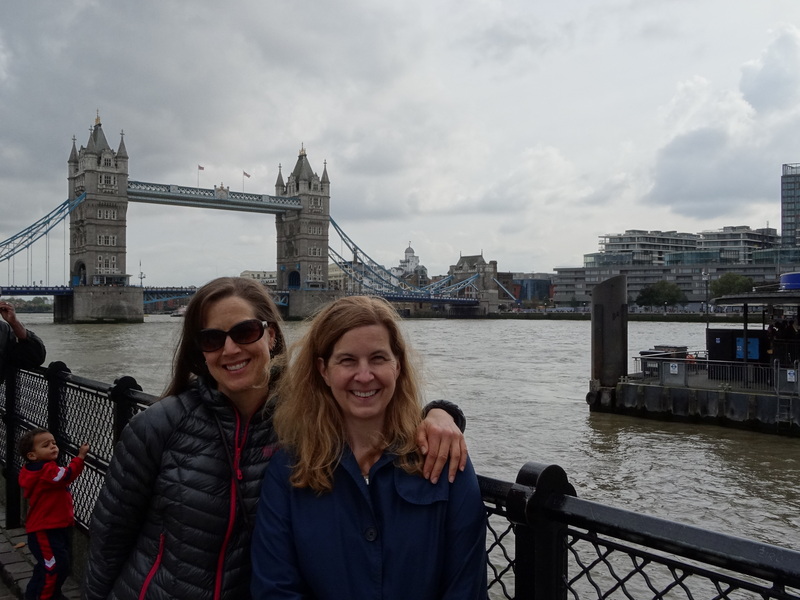 After a 5-hour train from Glasgow (Scotland), I arrived in England’s capitol city of London (population over 8 million), to visit my friend Sally who moved from Austin, Texas, where I know her from, to London over 5 years ago. It was great catching up with her on my first night over a bottle of wine at her cozy flat in Highgate. For my first full day in London, I explored the city. It was fun to see the sites I’d only seen on TV and in movies, including Piccadily Square, Buckingham Palace, Westminster Abbey, Big Ben, and the Thames River walk. I also visited the British Royal Museum, renowned for its extensive art collection from all over the world and the Tate Modern Art Museum. Later, Sally and I walked around the Springfield area and she took me to Rules, London’s oldest restaurant, for a drink. They usually adhere to a strict dress code but thankfully our smiles persuaded the door man to let us in wearing jeans and sneakers. The next day, Sally took me out for more sightseeing, including the Victoria and Albert Museum and The London Tower. After, we explored the market areas: Camden Lock, Borough Market, and Inverness Street Market. It was an explosion of people and color and cool unusual things, mixed with repeat versions of the same old touristy crap. It was people watching and window shopping at its best! We roamed around these market areas for several hours enjoying the scene, then stopped for an pint at a pub where the crowd was completely enthralled in the World Cup rugby match on TV. It seemed like the quintessential London experience. After a great visit with Sally in London, I took a 3.5-hour bus to Antwerp (population 510,610). It was interesting to be on the bus as it was loaded onto the train that then traveled under the English Channel to be offloaded on the other side in France. I went to Antwerp to hang out with my brother, Jabal, one of my favorite people in the world! He was on holiday in Antwerp to return to Belgium DesertFest, one of his favorite psychedelic rock festivals. I met him for Day 3 of the 3-day rock festival. We had a great time drinking Belgium beer, listening to music, and being the silly siblings that we are. Over the next few days, we explored the beautiful city of Antwerp, including the Main Square area, several lovely cathedrals, and the Scheldt River walk. Per Wikipedia, the Port of Antwerp is one of the biggest in the world, ranking third in Europe and within the top 20 globally. The city has a historic vibe despite the fact that it was hit by more V-2s than all other targets during the entirety of WWII combined. While the attack did not succeed in destroying the port, the city itself was severely damaged and was subsequently rebuilt after the war in a modern style. We also walked to an old fort located in a beautiful forested city park a few hours outside Antwerp. 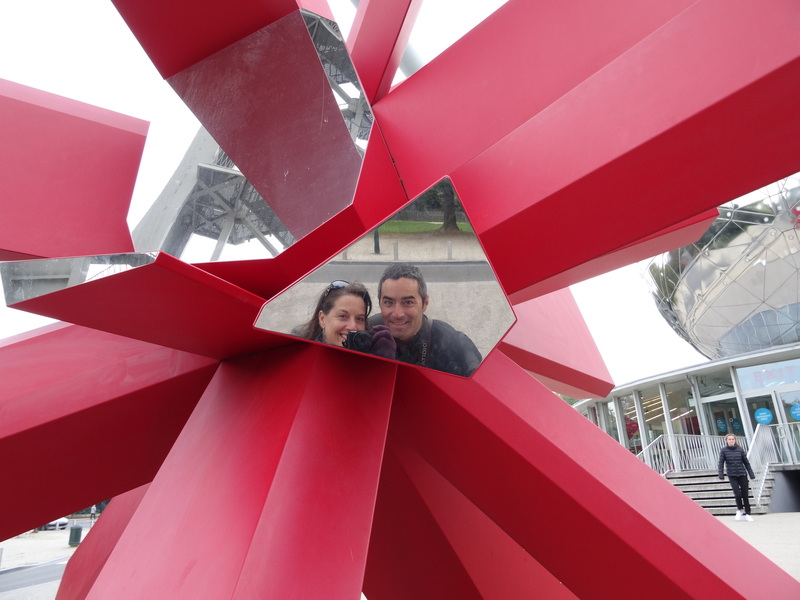 After a short train ride to Brussels, we visited Atomium, a structure constructed for the 1958 World’s Fair. Its stainless steel spheres are connected so that the whole forms the shape of a cell of an iron crystal magnified 165 billion times. It was very cool, as was hanging out my awesome bro! After a great visit with Jabal in Antwerp, I took a 5-hour bus to visit Paris for a second time (see previous post). This time, I visited my friend, Mathieu, a Parisian who I’d met in Argentina, then crossed paths with in Bolivia and again in Peru. I enjoyed relaxing at his flat and exploring parts of Paris I missed during my first visit, including the Eiffel Tower. Not only did I get to enjoy the amazing views of Paris from the tower, but Mathieu and I watched a movie from there. It so happened that NetFlix was having an event on the second floor to which we got last minute tickets. So we relaxed on bean bag chairs and watched the 2015 movie, Aloha, starring Bradley Cooper, on the second floor of the Eiffel Tower. So fun! After a great visit with Mathieu in Paris, I took a 7-hour bus to the Netherlands’ capitol city of Amsterdam (population 831,279) to hang out my friends, David and Paul, who came all the way from California to hang out with me! And, they brought me a large bag of tortilla chips, two bottles of salsa, and tequila, three things I’d been missing from home. I’ll admit it, I ate almost the entire bag of chips the first night. 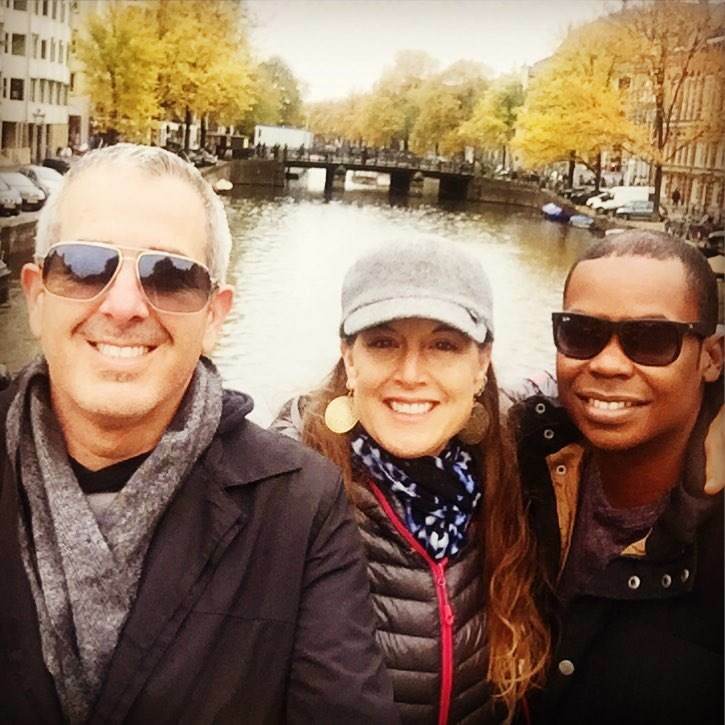 We had fun exploring the Amsterdam night life, hitting some bars and dance clubs, and exploring the sights of the city including the infamous Red Light District, “coffee” shops, and the areas along the endless maze of lovely historic canals. It was so great hanging with my California boys! After a great visit with David and Paul in Amsterdam, I took a 10-hour bus to Germany’s capital city of Berlin (population 3.5 million). This time, I was not in the city to meet friends, but to explore some history. To learn more about this historic city, I took a walking tour during which we visited sights including Brandanburg Gate, the Memorial to the Murdered Jews of Europe, the largest remaining section of the Berlin wall, Checkpoint Charlie, the Topography of Terror Historic Site, and the Spree River walk. During the tour, much of the WWII information I’d learned in high school history class came to life. On my second day, I visited the Sachsenhaus Concentration Camp and Historic Site. It was an emotional but very educational day. Interestingly, visiting a place where humans did horrible things to other humans helped me remember to always try to be compassionate, understanding, and loving towards others. After visiting Berlin, I took a 5-hour bus to the Czech Republic’s capitol city of Prague (population about 1.2 million) to visit my Czech friends, Renata and Gabriela, who I’d met and trekked with in Peru (see previous post). It was great to have my local friends showing me around the beautiful city of Prague, taking me to sights including Old Town Square, Prague Castle, St Vitus Cathedral, Charles Bridge, and the Vltava River walk. Per Wikipedia, Prague suffered considerably less damage during WWII than some other major cities in the region, allowing most of its historic architecture to stay true to form. As a result, the extensive historic centre of Prague is a UNESCO World Heritage Site. Along with exploring the city, Renata and Gabriella took me on a road trip to the Cesky Kras Protected Landscape Area, about an hour from Prague, where we hiked through a gorgeous forest in fall colors to one of the Czech Republic’s many castles and the nearby quaint village. It was so cool to hang out with such cool girls. After a great visit with Renata and Gabriela in Prague, I returned to Paris. 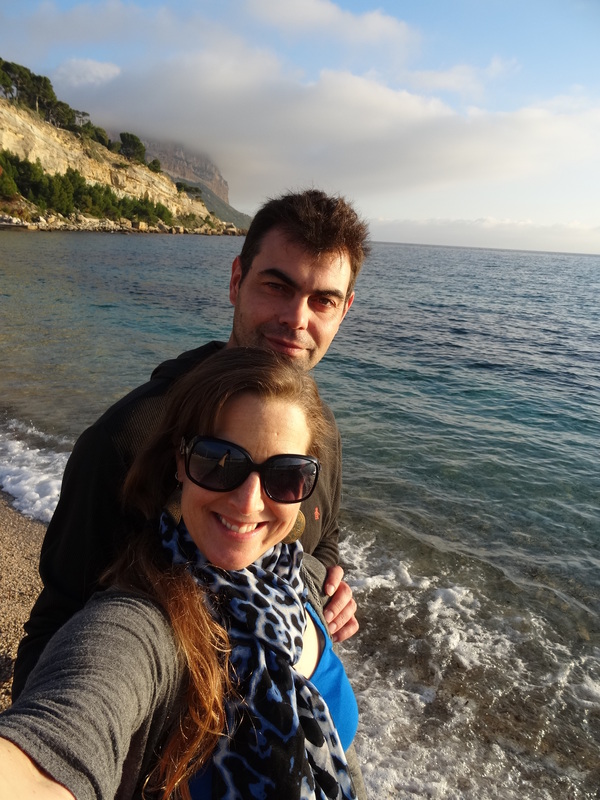 This time, along with hanging out in Paris again, Mathieu took me to Cassis, a small city (population 7,793) on the south coast of France, just east of Marseille. We traveled there via high-speed train. By car, this trip takes about 8 hours; by high speed train, it takes about 4.5 hours. Wow! Cassis is a small, quaint coastal town filled with many shops, cafes, a small marina, and lovely beaches. During our visit, we also explored the Espace Naturel des Calanques (Calanques Natural Landscape Area), trekking along the limestone cliffs overlooking the gorgeous clear blue waters of the Mediterranean, and the Plage d’En Vau beach, swimming in the gorgeous clear but cold blue waters of the Mediterranean. 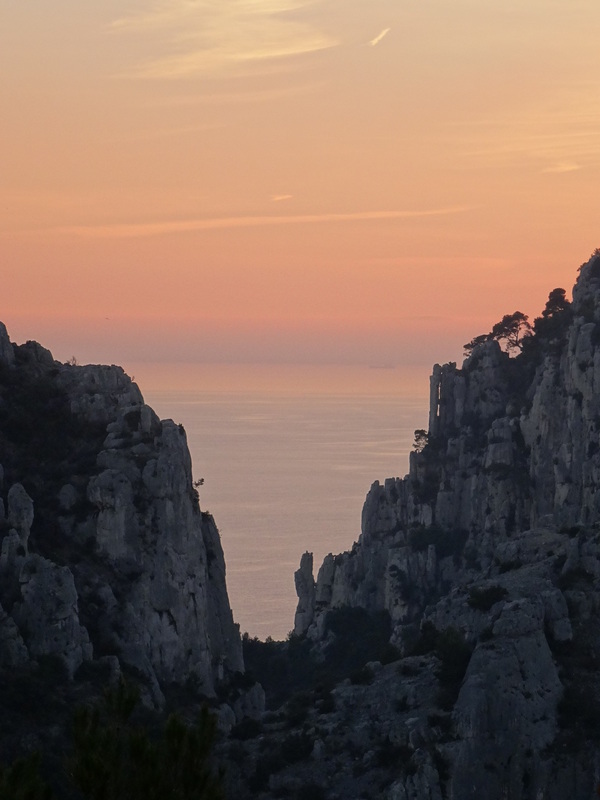 Per Wikitravel, “Qu’a vist Paris, se noun a vist Cassis, pou dire: n’ai rèn vist” (He who has seen Paris but not Cassis can say, I haven’t seen anything.” These words, spoken by Nobel-prize winning writer Federique Mistral, reflect the great attraction that Cassis exerts on all those who go there. I concur. It was great to hang out with Mathieu again and explore such a magical place. 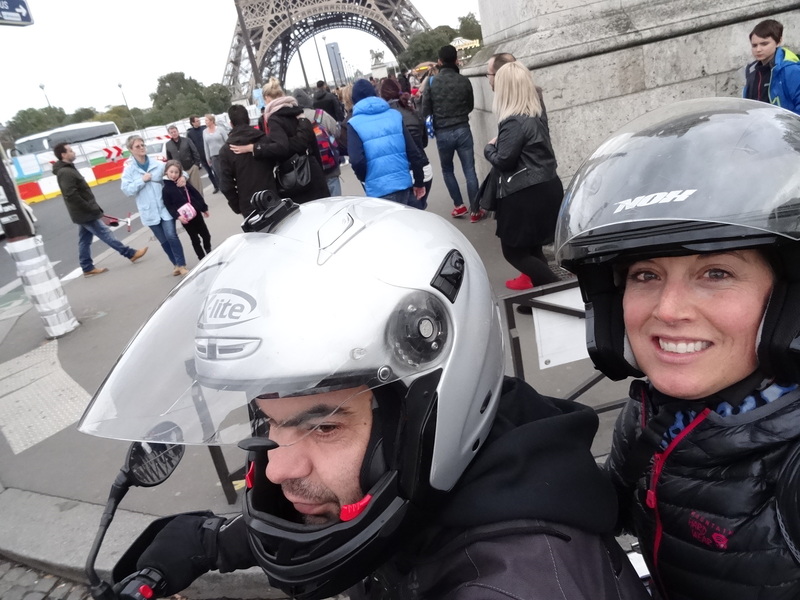 While somewhat brief, my visit to these lovely, historic European cities and beautiful natural areas was wonderful, and my experience was made even more memorable by the people with whom I shared it with. Thank you Sally, Jabal, David, Paul, Renata, Gabriela and Mathieu for a great visit!! Amsterdam with David and Paul. 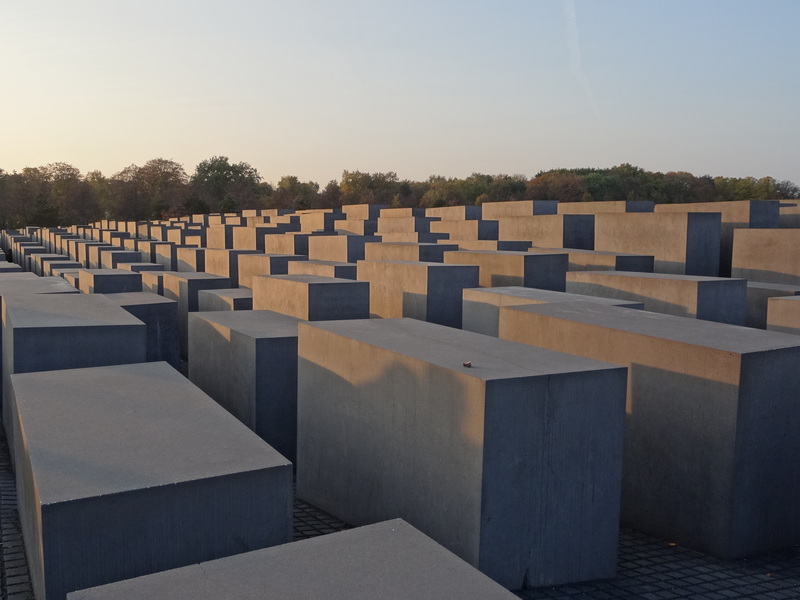 Berlin – Memorial to the Murdered Jews of Europe. 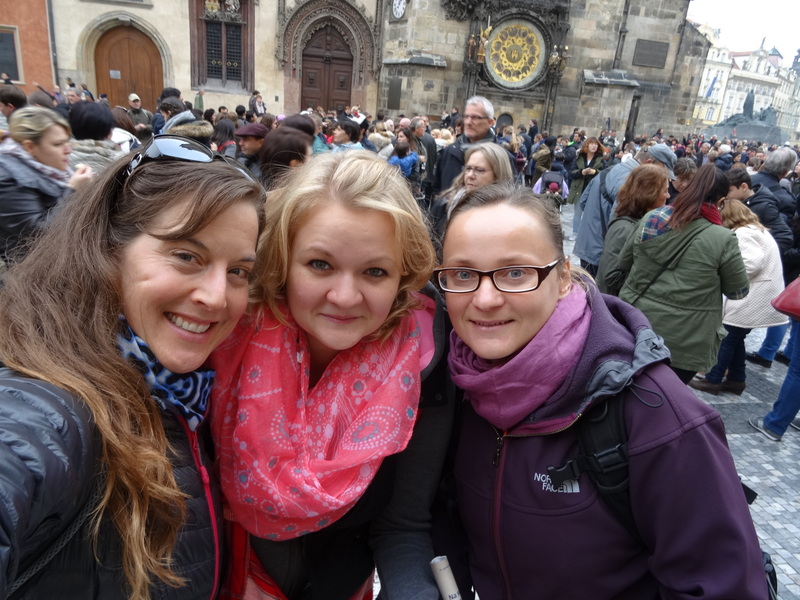 Prague with Gabriela and Renata.